Breno Magalhães graduated as an Architect and Urban Planner from Federal University of Minas Gerais (UFMG) in 2010 and as a Product Designer from State University of Minas Gerais (UEMG) in 2006, both in Belo Horizonte. Earlier, Breno had a brief carrier as a professional volleyball player until the age of 22. His interest in music and acoustics grew during his university period. Breno enjoys playing the guitar and he turned this hobby into his Product Design final graduation project, by developing an electric guitar with an innovative pickup swapping system for studio applications. The same thing happened in his Architect and Urban Planner graduation project when he designed a new music Arena for Belo Horizonte. At this point he was already a WSDG member. Also as a Product Design student, Breno took part in several research groups related to furniture design focused on manufacture optimization, ergonomics and sustainability. He was a partner in a design office with the same approach. 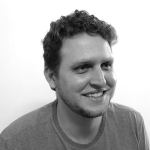 Breno works as a Project Manager and Designer at WSDG Brasil office since 2008.